How did Apollo-12 manage to land next to Surveyor-3? First “Space-Tourists”? 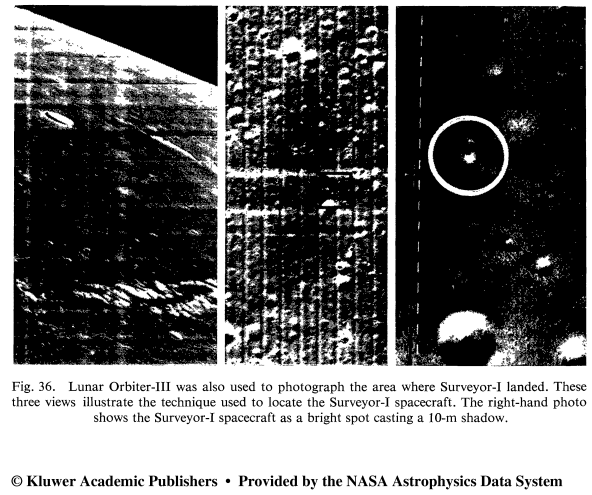 But it seems that Surveyor-1 was photographed from space by a selfie drone Lunar Orbiter 3. This interesting answer about the orbiter's "space darkroom" where it robotically developed photographic film while in orbit around the Moon, scanned the negatives, and then beamed back what are essentially "space faxes" to Earth links to the lengthy review paper Lunar Photography: Techniques and Results by JPL’s Raymond Heacock published in 1968. Clicking "print this article" generates a viewable on-line pdf. The paper is really worth a good read, it's full of interesting information. The Lunar Orbiter-III was used to photograph the Surveyor-I spacecraft sitting on the moon. 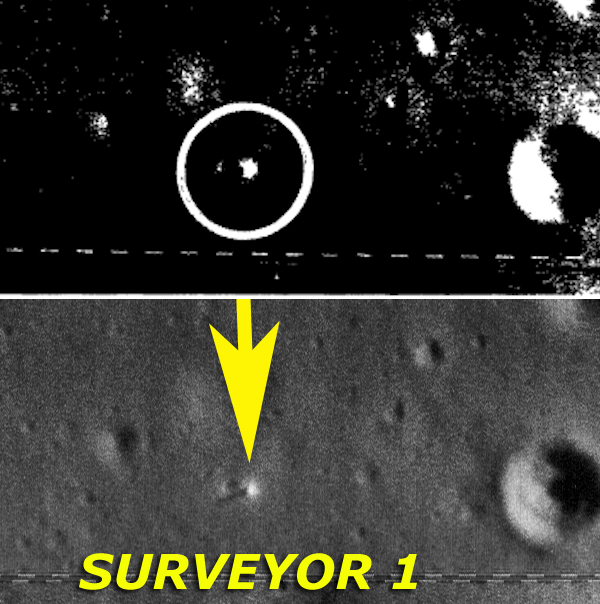 The three views of the lunar surface shown in Figure 36 are of the Surveyor-I landing area. The left-hand photograph shows the landing area in Oceanus Procellarum, the crater Flamsteed E, and the crater-wall peaks of the large-ghost crater which were photographed by Surveyor-I. 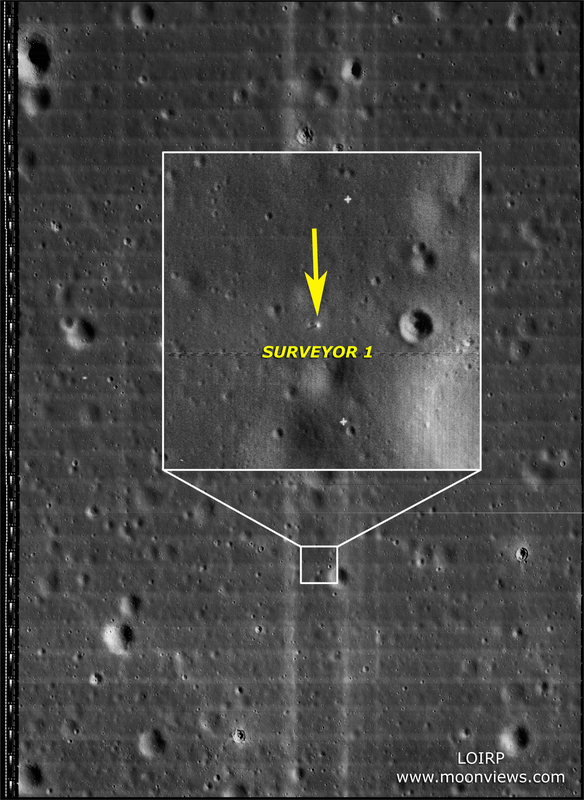 The center photograph shows the high-resolution camera view of the Surveyor-I landing area. The right-hand photograph is a 16 to 1 enlargement of a portion of the area inside the black square shown in the center photograph. The Surveyor-I spacecraft is seen as a white object casting a 10-m shadow. 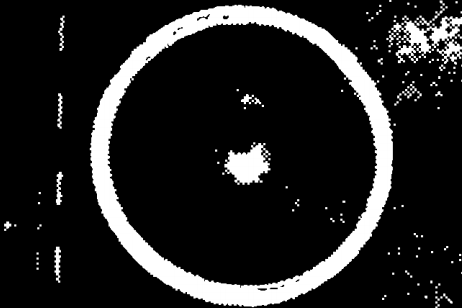 Unfortunately the reproduction of the paper in the linked pdf is a low tech 1-bit or half-tone reproduction, so I can't really see what's happening. Question: Is there a better source for this historic image? It doesn't look like exactly the same picture but the LOIRP released a picture of Surveyor 1 taken from Lunar Orbiter 3. It may just be rotated 90 degrees from the picture in the question based on that bright half illuminated crater. Edit: Thanks to uhoh for producing a scaled, rotated comparison image. Not the answer you're looking for? Browse other questions tagged history imaging lunar-orbit lunar-orbiter-program or ask your own question. What makes materials on the Moon look so different when the sun is high? Which mission delivered the first ever complete photograph of the Earth?